This is the Placemark of the day! A lot of folks are publishing this one around the web, so I should make sure all of you get a chance to see it as well. 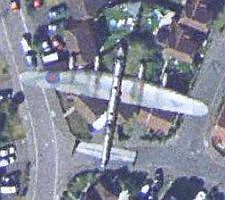 A first time poster at the Google Earth Community posted a placemark to this incredible sight of a fully restored Lancaster Bomber which just happened to be flying just about over his house (which is why he found it). According to other posters in the thread, this is the Battle of Britain Memorial Flight Avro Lancaster, normally located in the City of Lincoln, England (see website). But, it happened to be flying about in this Google Earth photo. As someone said, this would be an incredible 500th post in the GEC, but a historic first post. Another vote of thanks for finding this one SergioL. Those coordinates show an artifact in the satellite photo bought by Google from its supplier. I can't find the shadow of the plane. Somebody, found it ? The lancaster has the name City of Lincoln, that isnt its home, but it is based at RAF Coningsby in Limncolnshire. The Lancaster bomber and ones like it regularly fly over my house, the plane is over a housing estate called Stukely Meadows in Huntingdon near RAF wyton where I beleive these planes take off from. I live about 5 miles away. FAKE! There is no shadow & judging by the relative size of the bomber to the size of the cars, that thing must only be about 10 feet off the ground!!!!! The shadow is just a little to the front of the plane... the tail of the shadow is right off the plane's nose. This is not a fake. The plane is probably about 250-350 ft off the ground, most likely on the base of his approach to the airbase just to the northeast. The airbase in question is (or rather, was) RAF Alconbury which is now disused, as can be seen by the 'X' markings on the tarmac and the vehicles parked everywhere, so it is unlikely the Lanc is approaching to land. The 'shadow' does not match the shape of the aircraft and, since the minimum display height would be 800 feet or thereabouts the shadow would be much further forwards given the angle of other shadows on the ground, but where is it? It is the airbase to the northwest which is disused; the one to the northeast is RAF Wyton, very much still in use. It looks to me that this plane was at a very low altitude on the run in to RAF Wyton, the shadow is presumably there somewhere, but lost amongst the detail of houses and gardens. The "shadow" you refer to is NOT the shadow of the plane. As was already mentioned, it does not fit the shape. On closer examination you can tell that what it is a shadow of is the adjkoining backyard fences of the various properties. The plane is PA474 (Dressed as Mickey The Moocher), the only other airworthy Avro Lancaster is based in Canada. Based on the Wingspan of around 31m (102ft for non metrics...) the plane is in flight at around 250ft. Those who like trig. can replicate the maths based on whatever assumptions of reference sizes (ie cars/houses/etc) and the accuracy of the elvations provided by Google Earth. I FOUND THE BOMBER, THAT ENCOURAGED ME TO LOOK FOR MORE, I DECIDED ON SALISBURY PLAIN AS I SERVED THERE IN THE ARMY AND GUESS WHAT, I FOUND TWO CHEIFTAN TANKS. ONE WAS CAUGHT BECAUSE OF THE EXHAUST AT CORDINATES 51 DEGREES 13 18.75 NORTH AND 2 DEGREES 05 06.59 WEST AND IS FACONG WEST. THERE SHOULD BE THREE TANKS BUT I HAVE ONLY FOUND TWO. CAN ANYBODY IDENTIFY MY SECOND AND MY UNFOUND THIRD. If I was able to work this Google Earth I would open up the area and look for the shadow. But the sun is behind, about 6:30 on a clock face, nearly abaft the plane, and shining down at about 45 degrees. If this is a satellite photo the parallex would be nearly parallel, that is the plane obscures nearly its own size on the ground, just as does the sun's shadow. The shadow will be ahead of the plane at about the same distance as the planes altitude. Wow, we can't find a shadow so it must be a fake.... I can't find the shadow either, but I can think of a few reasons why not. 1.The height of the plane and the angle of the sun aren't known accurately. Being a sat image I can't see how the size of the plane will vary in any noticable or accurately measurable way if it's 2ft or 2000ft up. 2. Unless the plane is very low, the sun (not being a point source) produces a very blurred shadow. The higher up, the harder it is to spot. 3. The shadow may not be there at all. The relevent ground might be covered by another image at another time. 4. Or perhaps no-one has looked hard enough in the right place. I can asure anyone interested, that the Lancaster photo is not a fake, shadow or no shadow. The aircraft is Lancaster Mk3 PA474 'City of Lincoln' built in 1945, one of only two airworthy Lancasters in the world, and is based at R.A.F Coningsby in the county of Lincolnshire U.K, as part of 'The Battle of Britain Memorial Flight'. At the time of the photo, the Lanc: was flying over the town of Huntingdon in Cambridgeshire on a slight northerly heading making for it's home base. I have seen this aircraft fly over my home on numerous occasions, once flying quite low doing a 360 degree turn as it did so and I was able to grab a camera and photograph it. I am a member of 'The Lincolnshire's Lancaster Association' which helps to support this aircraft that is still owned by the Royal Air Force. The disused airfield shown just to the north west of the Lanc; is the old R.A.F. Alconbury which at one time was a very busy air base used by the United States Air Force with thier lovely Phantoms. The Lancaster never operates from R.A.F. Wyton. How many escape hatches were there on the Lancaster and where were they placed? The Lancaster was a WWII bomber. As such, there are few if any in existance today, and certainly none in military service. This photo seems fake to me. A LANCASTER flew over my house in Brampton, Ontario Canada, a couple years ago. VERY LOUD, Anyone who lives in that area would be able to confirm the authenticity of the photo. My Grandfather worked on them at AVRO in MILTON ONTARIO. I reckon it's positioning right base leg for a fly past or landing at RAF Wyton, the main Lancaster Pathfinder base in WW2 and home to regular air shows. Normal flights would avoid built up and residential areas but the Lanc is somewhat special being only one of two airworthy ones in the world. Now repainted Phantom of the Rhur, PA474, is quite likely to have been flying in that area and at a low height. Good find! I've checked it out on google earth. Unless the chaps at google earth are in the habit of putting misc objects in their pictures, it has to be real Check out the B29 over Manchester & the Lockheed lightening over Croyden!!! !